“This report should terminate this matter,” Warnes wrote in a letter he sent to Michael Pruett, standing in for County Attorney Daniel Haygood, who has been out of town. Warnes included a two-page Special Master Report in which he rejected Bell’s contention that Davis had violated eight separate prohibitions of the Ethics Ordinance. Bell had filed her complaint on Oct. 12, and Pruett had delivered it by hand to Warnes on Oct. 13. Warnes dates his letter and report for Oct. 16. Bell received a copy of Warnes’ report to Pruett yesterday at her 1201 Arrowhead Road address east of Butler's Crossing. 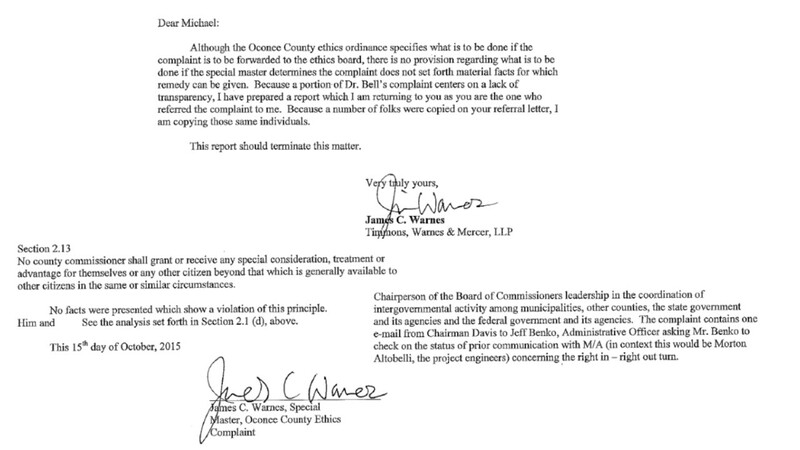 “The basis of the complaint appears to be that Commission Chairman Davis improperly instructed Oconee County employees to gather information about a road project which would benefit one individual,” Warnes wrote in his report, which I received today via an open records request. Bell had submitted copies of eight email exchanges involving Davis and other county officials in support of her complaint, which grew out of an effort by Davis to get the county to redesign Mars Hill Road to accommodate a reconnection of Old Mars Hill Road. The Board of Commissioners at its meeting on Aug. 29 refused to go along with the proposal. In the Master Report, Warnes responded to each of the eight sections of the Ethics Ordinance that Bell contended Davis had violated. ✱Put loyalty to the highest moral principles and to county above loyalty to persons, party, or county government department. ✱Engage in no business with the government, either directly or indirectly, that is inconsistent with the conscientious performance of governmental duties. ✱Uphold these principles, ever conscious that public office is a public trust. ✱Never engage in other conduct which is unbecoming to a member or which constitutes a breach of public trust. ✱No county commissioner shall grant or receive any special consideration, treatment or advantage for themselves or any other citizen beyond that which is generally available to other citizens in the same or similar circumstances. Warnes cited the email correspondence submitted by Bell in rejected the remaining three complaints. ✱Never discriminate unfairly by the dispensing of special favors or privileges to anyone, whether for remuneration or not. Warnes said that the email correspondence showed that Davis requested that County Administrative Officer Jeff Benko contact Public Works Director Emil Beshara about the reconnection of Old Mars Hill Road to Mars Hill Road proper. Warnes said while Perry Aycock, who owns land along Old Mars Hill Road, may have requested the change, that did not matter. “The proposed change will benefit all of the residents of the Oak Ridge Subdivison as well as the general public traveling east on Mars Hill Road and desiring to go toward downtown Watkinsville,” Warnes wrote. ✱No county commissioner shall knowingly withhold any information that would impair the proper decision making of any of the county’s boards, agencies, authorities, or departments. “In fact the information in the emails presented taken as a whole shows that Commissioner Davis was asking for information and analysis upon which the entire Commission could make a decision,” Warnes wrote. ✱County commissioners, as policy-makers, shall refrain from unduly interfering in the daily administrative affairs of department supervisors. Commissioners shall not give directions or make suggestions to the department supervisors or other employees on an individual basis. All directions should be made in accordance with the County Organizational Policy. 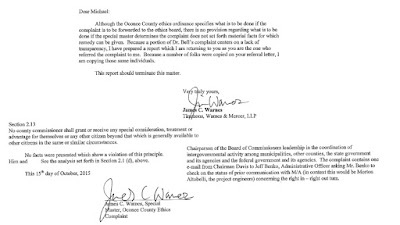 Warnes cited the 2009 ordinance passed by the Board of Commissioners, which includes an organization chart, in responding to this complaint. The organization chart shows Public Works Director Beshara reporting to Administrative Officer Benko, who stands between the five commissioners and the department heads. But Warnes argued that the 2009 ordinance says the chairman has the responsibility for coordinating intergovernmental activity. Since the Old Mars Hill Road reconnection involved the Georgia Department of Transportation, Davis was behaving properly, according to Warnes. Warnes made no reference to two emails that Bell had submitted with her complaint and that were written by Public Works Director Beshara. One of those was directed to Commissioner Jim Luke and copied to the other three commissioners. In it, Beshara said he had been asked by Davis to contact GDOT about the possibility of amending the plans for Mars Hill Road to accommodate the reconnection of Old Mars Hill Road at Barber Creek Drive. Warnes’ report contains several grammatical and typing errors. The last sentence before the date and signature, for example, has a line that seems to have been incorrectly dropped into the text. Warnes also refers to Moreland Altobelli, the prominent engineering and program management firm headquartered in Duluth, as Morton Altobelli. Had Warnes concluded that Bell’s complaint had merit, the next step would have been the empaneling of a Board of Ethics. The Ethics Ordinance does not provide for any appeal of Warnes’ decision that the complaint does not have merit. I will be sure to remember and act with my vote. The purpose of the $ 10, 000 expenditure is clearly an act of an old boy in a position trying to help another old boy friend. Oconee County has grown way to much for us to continue to allow Mayberry style government. How often has Davis or any of the other commissioners created unethical expenditures we will never now.Thank you Sarah Bell for bring this matter to everyone's attention. It's our money and our government that we need to protect. How can authorizing spending almost $10,000 without the other commissioners knowing about it not a violation of the way money is spent regardless of how many people benefit from it. I hope if the reconnect of old and new Mars Hill roads comes before the commissioners again they will vote NO!!! They definitely need to appoint a new special master! Thank you, Sarah Bell. You tried. It will be up to the voters, I guess, if there is ever to be any improvement in Oconee County government. But voters are slow to learn. Good ol' boys reigning as usual. Remember this when election comes up. At the very least, MD should repay the 10K from his 100K+ salary. Problem is most voters don't care or don't know what goes on in the county. Only way is to get outside news sources involved ie: Athens paper, or Atlanta papers or TV stations to begin to dig into this and the many other things that over the years have gone on behind the backs of the other 4 commissioners. Not much time, primaries come early this time. Who signed contract with design co. authorizing the drawing of the reconnect of old Mars Hill to new Mars hill? How was the price determined? Coincidence just under $10,000? Anyone else find it strange? I agree with all of you and will also use my vote against this. Amazing that there is no appeal of a decision about commissioner ethics by a person appointed by those same individuals. What an amazing conflict of interest - unethical itself. No wonder there are typing errors. He wanted to get rid of it as soon as he could. Thanks for Sarah Bell for trying. Sara Bell watch your back. King Melvin has a memory like an elephant and a get even vindictive streak. He will find other people to try and retaliate. Make sure all your business is in order. Too bad if others that may have knowledge of back door cronyism can't speak up and bring light to them. Surely the other commissioners must get tired of being kept in the dark. Thanks for being brave enough to try. Sadly, Warnes isn't independent; he was appointed to his position as special master by the BOC. I expect nothing unbiased from him. He should have been appointed by other Oconee Co. leaders, not those for whom he would sit in judgement. Who actually authorized the county's spending $9,000+ on the DOT Old Mars Hill reconnect study? When was this study completed? The 4 commissioners seem to have known nothing of it til Aug. of this year. What is Davis' relationship with Perry Aycock? Read Melvin's carefully crafted answers to The Oconee Enterprise. Just not crafty enough to fool me. For Warnes to say in his response to Bell that the Mars Hill redesign would benefit the community and Oak Ridge subdivision is ludicrous. Not one of those homeowners questioned earlier agreed with Warnes' later proclamation. And only the directly affected landowner Perry Aycock, 1 of 50 citizens at the BOC meeting, was in favor. Assuming Melvin sets meeting agendas, he clearly knew enough about the road redesign topic to put it on the Aug. 25th agenda - the other commissioners knew nothing. And Melvin already anticipated "approval" of Mars Hill Rd modification at the Sept. 1 meeting as it appeared on the agenda for that meeting dated Aug. 21 as if if it already had consent by the BOC - albeit without "additional meetings and a public forum". How on earth could BOC hold additional meetings and a public forum in less than 7 days, 2 of which days were Sat. & Sun.? Someone had to "authorize" the almost $10,000 county expenditure - who were the "others" that did that since Melvin claims it wasn't him? Beshara, Benko? And at who's direction? Why didn't the redesign topic come before the BOC last October, or April of this year or any time BEFORE the $10,000 was spent? The initial $115,000 additional from the county to complete this redesign then grew to $140,000. Did Melvin actually think he could just slip all this in unnoticed?